1856 British Guiana Magenta to be sold! One of the world’s most famous and valuable stamps will soon be up for sale. Sotheby’s New York recently announced that it will be auctioning off the 1856 British Guiana Magenta to the highest bidder on June 17th, 2014. This «Holy Grail» of philately is expected to go for an estimated $10-20 million USD! Why, you may say, would anyone pay so much for an itty, bitty piece of paper? Well, like the Treskilling Yellow, this little piece of paper is a one-of-a-kind stamp (see article: Top 5 most valuable single stamps in the world ), which currently holds the world record for the most expensive stamp ever sold at $2.3 million in 1996. The 1¢ Magenta is believed to be the last existing copy in the world. As the Scott World Catalogue states: «It is unique». It is considered by most to be the most valuable and rare stamp in the world, and it will by all odds probably beat the Treskilling Yellow record. A provisional stamp, the 1¢ Magenta was commissioned in 1856 by the local postmaster when a shipment of stamps from England was late arriving in the colony. Concerned that the lack of stamps would cause an interruption of the postal service, he authorized a firm of local printers to print the emergency issue. Little did he know that he was making history! Fast-forward seventeen years and you arrive in 1873, the year that L. Vernon Vaughan, a 12 year old schoolboy, found the stamp in among some family correspondence. Unable to find a mention of it in a stamp catalogue and not realizing what he had, he sold the stamp to a local collector for 6 shillings. As you can see in the picture at the beginning of this article, the stamp is not much to look at. Years of dirt and grime seem to have almost completely obscured the image. 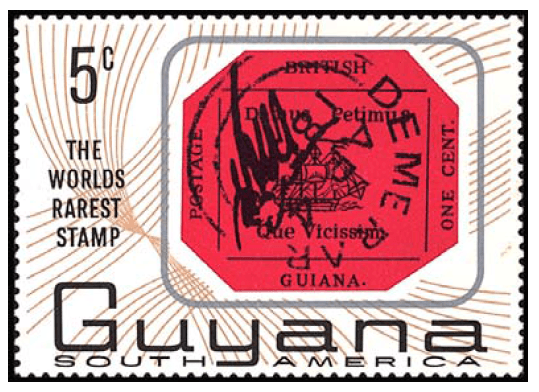 If the British Guiana Magenta was in pristine condition it would resemble the stamp of this Guyana commemorative issue (see below). Technically speaking, the 1856 British Guiana Magenta is a 1¢ imperforate stamp, shaped like an octagon (because its corners were snipped), magenta colored with black printing. It bears the image of a sailing ship, as well as the Latin inscription «Damus Petimus Que Vicissim» (translation: We give and expect in return). The stamp has been cancelled and also bears the initials of a postal employee of the time (E.D.W.). The stamp will be exhibited in various cities around the world, no doubt to build excitement for the auction and to allow the public to see it before it might get locked in a safe for another 30 years. It will be back in New York City on June 14th in order to be exhibited at Sotheby’s Auction House for the three days preceding the auction. Will this auction make stamp history and beat the world record? We’ll have to wait to wait till June 17th, stay tuned for the auction results! Brigham Auctions just sold the rarest stamp of Canada! 1856 British Guiana 1¢ Magenta fun facts!